Humans are not the only ones to suffer from spinal conditions. Animals can suffer from spinal injuries, issues related to spinal degradation and can be born with spinal deformities. One example of the latter is Short Spine Syndrome, a rare condition that only about 30 dogs around the world have. Meet Cooper. 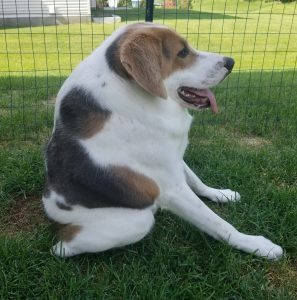 Cooper is a dog with Short Spine Syndrome who was rescued in 2017 by a group called Secondhand Hounds. When Cooper was about 2 months old he was found by animal control officers near a suspected puppy farm in Virginia. He had worms, ear mites and a hernia. The rescue group Secondhand Hounds helped treat him and found him a new forever home. What is Short Spine Condition? It is suspected that Cooper was abandoned as a puppy because of his rare genetic condition, Short Spine Syndrome. The condition, which is thought to be caused by inbreeding, causes the vertebrae of the spine to remain in a more cartilage-like state instead of strengthening into bone. As a result, some of the vertebrae fuse together, restricting movement. This compression of the spine leads to a shortened spine. In most dogs with Short Spine Syndrome the cervical spine compression makes it look like the dog has no neck. Because of this, if the dog wants to look behind him he has to turn his whole body around. The shortened spine also leads to shorter bodies in dogs with this condition. Since the condition doesn’t affect the limbs, the dogs’ bodies look short relative to the size of their legs. Secondhand Hounds helped a dog with Short Spine Syndrome back in 2016 as well. That dog, Quasimodo, was a 5-year old German Shepherd. At the time it was believed that there were only about 14 dogs worldwide with this condition. However, Quasimodo was such a happy, friendly dog that he quickly made headlines and other people came forward sharing their stories about their dogs with Short Spine Syndrome. It is now believed that there are about 30 dogs worldwide with this condition…and many of their families say that they are loving and happy!